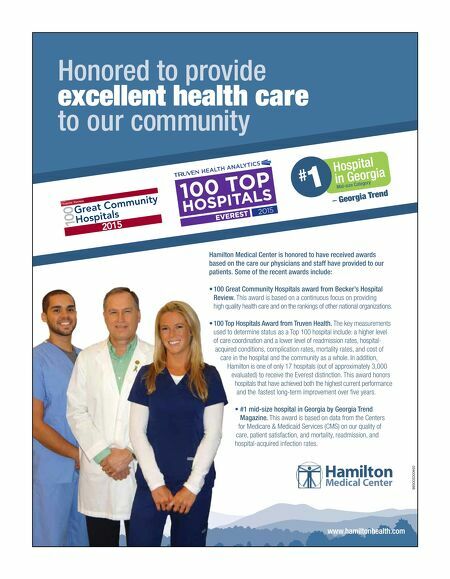 14 The Daily Citizen ◆ HOW TO CHOOSE GUIDE 2015 In the majority of cases, when you experience a medical emergency and dial 911, you will be given a choice of hospitals in which to receive care. Do you know where you want to go? We encourage you to do your research now before you are faced with a medical emergency. Here are some factors that can help you choose the best hospital: Location Location will naturally play a large role in your choice. Ideally, the hospital you choose should be close to your home or workplace. When an emergency happens, you will need to be seen by qualified medical person- nel as soon as possible. In addition, being cared for at a hospital that is near your family and friends can pro- vide a major benefit. Having access to your support system during an ill- ness has been proven to help reduce stress and provide companionship, which can aid in both mental and physical recovery. Most importantly, take the time to find a physician and a hospital that you trust with your health. Physician of choice It is important to choose a hospital in which your preferred doctor has privileges. Physicians who have regu- lar privileges at a particular hospital are familiar with the site, the equip- ment and the staff. Ask your doctor where he or she has privileges. Another benefit of choosing a hospi- tal where your doctor has privileges is that he or she will be able to col- laborate with other familiar and trust- ed providers in the area. Insurance Another important consideration in your hospital choice is whether your insurance will be accepted. Insurance carriers will pay some of the cost of services from a preferred provider, including hospitals. Verify which hos- pitals are in your carrier's network. Awards and certifications Knowing what awards and certifi- cations a hospital has received is also important. For example, a hospital may be accredited with The Joint Commission, an organization that verifies specific standards of care within medical facilities. This accred- itation means that the hospital has passed frequent performance reviews and provides quality, consistent care. Researching what other awards a hos- pital has received will also give you a sense of the hospital's ranking amongst other hospitals in the area. Determining the highest quality hospital for you and your family will help you achieve the best outcome during instances of illness or injury. Since hospitals offer a variety of care and services, be sure to analyze all of the options before you decide. By knowing the facts and keeping your own priorities in mind, you will be able to make a wise choice when selecting the hospital that is best for you. 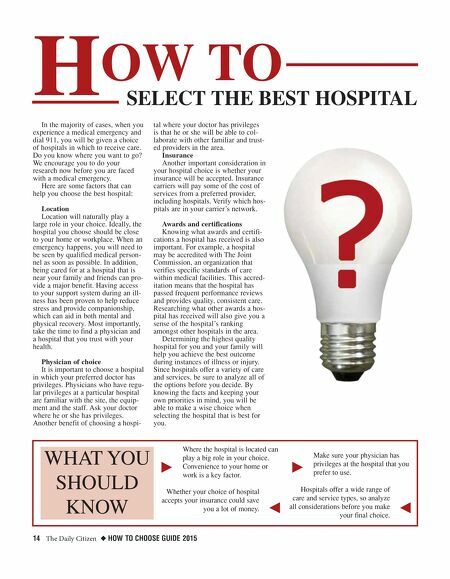 H OW TO SELECT THE BEST HOSPITAL WHAT YOU SHOULD KNOW k j Where the hospital is located can play a big role in your choice. Convenience to your home or work is a key factor. Whether your choice of hospital accepts your insurance could save you a lot of money. k j Make sure your physician has privileges at the hospital that you prefer to use. Hospitals offer a wide range of care and service types, so analyze all considerations before you make your final choice.